The Saylor Family is a very old family. Traces of the name appear in Germany as early as 1388, as on that date one Burchard Seiler gave the City of Nuremburg a gift. The interest or income therefrom was to be spent for "bread, beef, pork, peas or flour or herring according to the season of the year, but at all seasons bread shall form one half part". This charity is known as the Church Yard Alms and is given every Sunday among the poor and the value was to be one-tenth part of a florin. This gift was ratified by the Council of Nuremberg Sunday before St. Vitus day 1388. For this benefaction to the Housekeeping Poor of the City of Nuremburg, Burchard Seiler was given recognition by the bestowal of a Coat of Arms and his body was buried back of the Choir in the Church of St. Sibold, Nuremburg, Bavaria, Germany. This information is gleaned from a History of the Saylor Family by James Saylor of Eaton, Ohio. Unfortunately we cannot, or at least have not connected, our family genealogy with this venerable man, much to our regret. We have, however, a number of original records of our family, which extends back to the latter part of the sixteenth century. It appears that the descendants of this numerous family, have changed the name and Anglicized it till we of today do not carry the original spelling and at first thought we lose the significance of it. Our immediate family, at least the original emigrant coming to this country was a German, and not a Swiss, as many suppose. However, he may have lived in Switzerland prior to coming to America as I will endeavor to prove later. The original spelling of the name is S-E-I-L-E-R, which in German means a "rope maker". Therefore, obviously someone in the remote ages past must have acquired the trade of rope maker and not a sea-faring man as many suppose, as all family names originated from some trade, place or happening. I. My first son Ulrich Seiler is born at Wilstig the 16th of the Winter Month in the sign of Aries, in the New Moon Anno 1706. Died June 1707. II. My son Daniel Seiler is born at Sembauch the 15th of June in the sign of the Scorpion, in the Old Moon Anno 1708. III. My daughter Hedwig is born at Obermelingen in January 22, in the sign of the Scorpion, in the Old Moon Anno 1712. IV. My son Jacob Seiler is born at Obermelingen the 30th of January in the sign of the Lion in the New Moon Anno 1715. V. My daughter Gertrude is born at Ischbach in March 1718 and died January 2, 1719. VII. 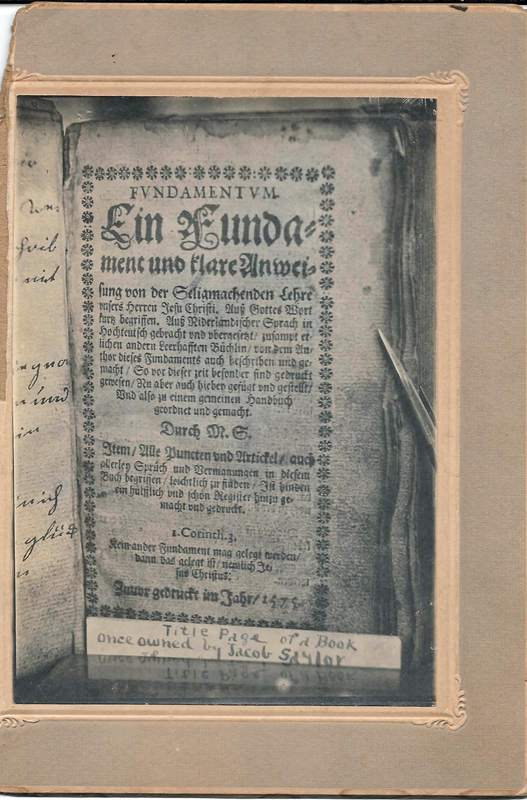 My son Johannes is born at Ischbach the 22nd of July 1723 in the sign of the fish in the Old Moon, and died June 26, 1725. 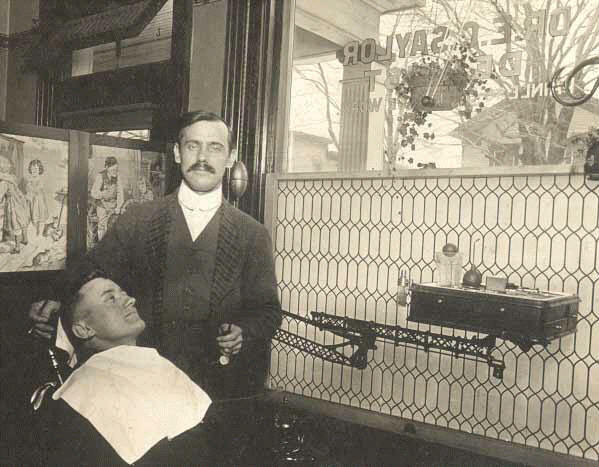 [Thw following photographs were recently found at the Berlin Area Historical Society. This is the record of the first family, which has come down to the present generations, and our family, here assembled, are direct descendants of the fourth child Jacob, who was born in 1715. This [Jacob] was the oldest descendant of our family who immigrated to America. He is buried in the old family burying ground on the middle hill of the old homestead in full view of the town of Meyersdale, Pa.
"This book belongs to me Jacob Seiler and I inherited it from my father, Joseph." dated January 12, 1740. "Melsbach"
"This book belongs to me Jacob Seiler. Were it not mine, I would not write my name therein. God gives me the grace that I can learn and retain what therein is. Jacob Seiler is my name. My luck and my blessings rest in God's hands." 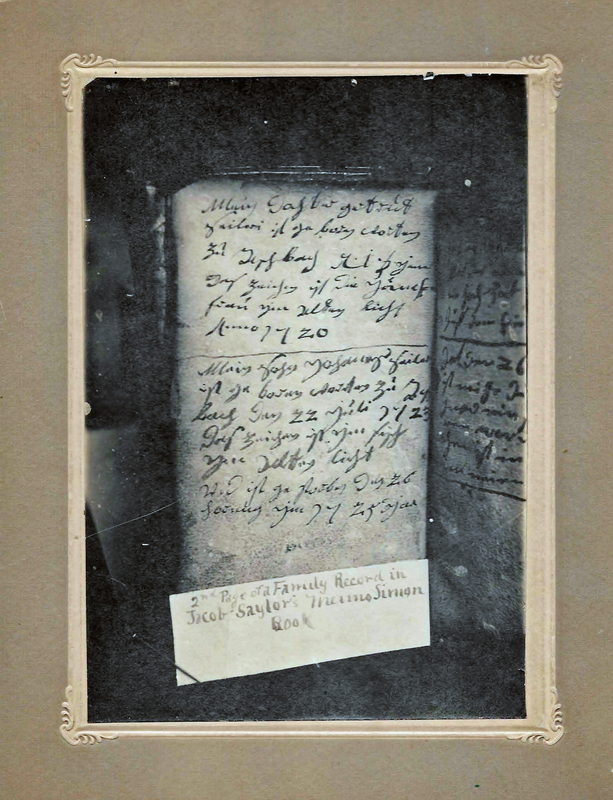 "The 19th of March 1739, I, Jacob Seiler held a wedding with Magdalina Stald from Fishper.."
"The 26th of May is born to me by God's grace a son in the sign of the Twins in the New Moon 1740." Thus, you see, in these few records we have three generations. 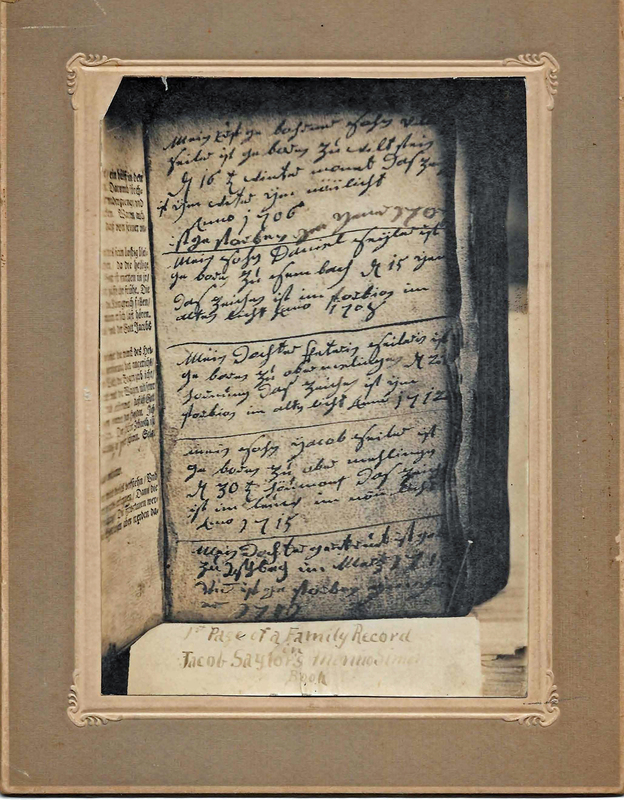 These records are written on the blank fly-leaves of a small book A Collection of Religious Writings by Menno Simon printed in 1575. A photographic copy of which is in possession of E. C. Saylor, Berlin, Pa., August 22, 1931. 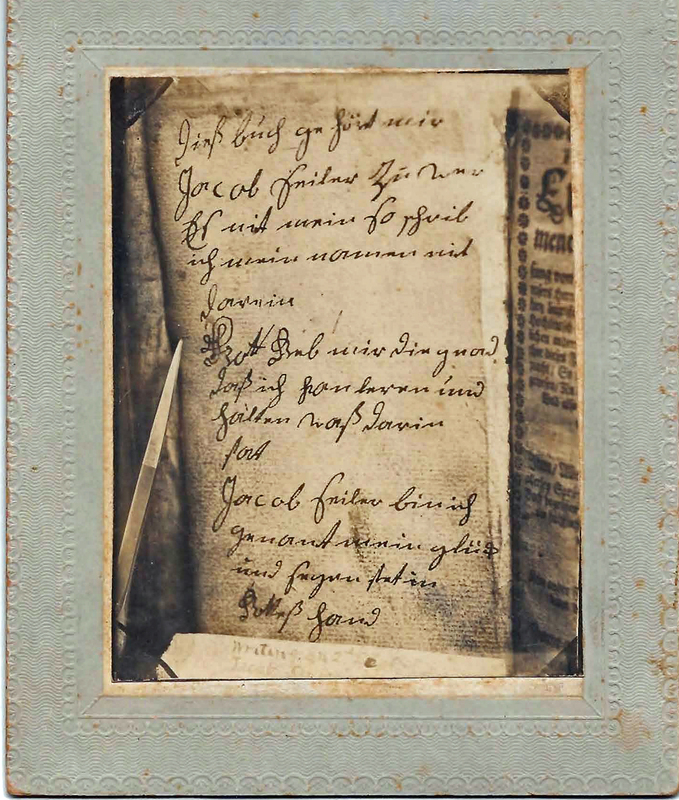 The will of Jacob Seiler executed Feb. 20, 1790, names daughters Nancy, Magdalena and Catherine. Catherine married a man by the name of Berkey. I, John Seiler, was born in the year 1740 the 26th day of May." "Johannes Seiler died in September 1822, the first of September." "And married Caterina Berkey the 27th of October 1761. My wife Caterina died the 18th day of May 1809. My mother died 27th day of January 1784. My father died 15th day of April in the year 1793. His age was 78. 1. Magdalena Seiler was born the 24th of November 1762. The sign of the Fish. Magdalena married Jacob Fahrney the 16th day of April 1786. 2. Anna Seiler was born the 16th of December in the year 1764, the sign of the Twins. Anna married John Speicher the 4th day of May in the year 1783. 3. Jacob Seiler was born 2nd October 1766. The sign is the Scales. Jacob married Maria Leibengut (Livengood) April 1, 1787. 4. Hans Seiler was born the 26th August in the year 1768, the sign is the Waterman. Hans married Barbra Boauch, January 2nd , 1791. 5. Christian Seiler was born the 4th of February 1771. Died February 15, 1773. 6. Frannie Seiler was born September 24, 1773. The sign is the Ram. Frannie married Hen Gorg Dempf the 12th of November 1793. 7. Caterina Seiler was born in the year 1776 the 22nd of August. The sign is the Fish. Caterina married Jacob Blauch in the year 1798, July 1st. 8. Maria Seiler was born in the year 1780 the 12th of December. The sign is the Twins. Maria married Abraham Miller in the year 1800 the 22nd of November. 9. Christian Seiler was born in the year 1783 the 24th of April. The sign is the Waterman. Died 1792 the 24th of July. This record, you will notice, gave two Christian Seilers , one born 1771 and died 1773, and the other born 1783 and died 1792. We take it that those two children were brothers and following the custom of his grandfather, Joseph Seiler, our worthy ancestor gave two sons the same name. Fannie, who married Hen Gorg Dampf. These families I have not been able to find any trace of especially the Speicher children. There is also a possibility that the Fahrney family of Berlin are descendants of this couple as the old Forney homestead was near the Boauch/Blauch who had intermarried into the family. And would it not seem reasonable that relatives should settle near one another. Positive proof , however, is lacking at present. According to the records a very sad occurrence took place in the family of John Seiler as regards the records of the deaths of one son and six grandchildren from June 1, 1792 to July 30, 1792. The results of some epidemic the nature of which has not been revealed to the present generation. The Seiler family is undoubtedly of German origin as the records state "Melsbach" which appears to have been the residence of Joseph Seiler is in Germany, County or State of Coblens. Sembach is also in Germany, County of Pfalz, Bavaria. As to Obermellingen, I have not been able to locate. However, there is a city or town of Melingen in the Grand Dutchy of Saxe-Weimer, Eisenach not far from the city of Weimer. From another authority, I learn that Ober Mellingen is in the State of Nassau on a small river named Muhl, a short distance southeast of Nastatten. Ishbach is evidently in Switzerland. Just when the Seilers came to this country we do not know exactly. Authentic evidence, however, states that they were in Somerset County as early as 1772. As stated in the first assessment records of Brothers Valley Township, Bedford County, Pa. At that early date, John Seiler had a few acres of cleared land. It appears that the Seilers first settled near Meyersdale on what is now the farm owned by Mr. Cyrus Hostetler whose wife is a grand-daughter of our ancestor John Saylor who is buried on this farm on which we are now so pleasantly enjoying ourselves. Later they moved to the hill over looking Meyersdale which has been known as Saylor Hill for 150 years; and which has not been out of possession of some member of the family until about 20 years ago when it was purchased by the Somerset Coal Co. Even then it was tenanted by some descendants for a number of years. This farm, or rather, two farms which was originally patented, I think in 1774, and known as the THREE HILLS, a very appropriate name I assure you, is a landmark for miles in all directions. From the first hill a magnificent view of Meyersdale can be had and also of the surrounding country embracing the valley of the Casselman River and its immediate tributaries, the Flaugherty, Elk Lick and Blue Lick creeks. On the middle hill is situated the old family burying ground in which lie the remains of a great many of our ancestors. The oldest of which is Jacob who was born in 1715 and died 1793. The last body buried there was a four times great-grandchild who died some twenty years ago. The first burials occurred in 1792. As far as I can learn we cannot claim any Revolutionary stock from our ancestors, as Jacob Seiler in his will states that he is a minister of the Society called Mennonite, which as you are aware are non-combatants. I am not sure that that accounts for their settling in this frontier settlement of our country to escape the horrors of the Revolutionary War, which was then disturbing the minds of the people in the eastern part of our state. I have no record of Jacob Seiler living anywhere in the eastern part of the State. However, his brother, Daniel, settled in Lancaster County, and from him sprang a large family and it is more than likely he [Jacob] at least stopped there awhile. Tradition has it that John, born in 1740, was the first to settle here in this county. And that after the death of his mother, John brought his father Jacob here. The wife of Jacob Seiler, who died January 27, 1784, is not buried in the old family cemetery, unless in an unmarked grave. All of the graves are very well marked. Jacob Seiler is also mentioned, but seemed to have no personal property, family or house. He evidently stayed with his son John. The Seilers were a peace loving people as indicated by a story once told to me by Martin Saylor who died many years ago. He told me that there was an Indian Village at the Junction of Elk Lick Creek and the Casselman River. The Seilers living on the hill just above, they came in contact with them frequently yet never had any trouble in any way. The Seilers attending to their farming and daily work, while the Indians pursued their mode of living. In the procuring of the property known as Saylor Hill or the old patent name of THREE HILLS, John Seiler made application to the government, but it was granted to his father Jacob, who by will gave it to his grand-son and grand-son-in-law. John Seiler, himself, never owned any real estate and his sole inheritance being the Family Bible and another German book, but was appointed to settle his father's estate. John, never having an estate to settle, or at least never went through any legal proceedings. It is our wish that each and everyone constitute him or herself a Committee of one to do all in their power to make this historical sketch of our family more complete. Please, report to your historian, any occurrence of historical value with copies of all records, which should be preserved. [The above page copied with permission from the Hans George Fulk and Jacob Seiler Family Workbook by John H. Stangarone, Sr. and Stewart R. Saylor, ©1997. Copyright © 2018 - 2003 Stewart R Saylor. All Rights Reserved.